This is a great recipe for an easy and quick vegetable side to complement any weekday meal. It’s savoury and delicious and because cauliflower is one of those vegetables that doesn’t have a strong flavour; it can pretty much go with anything. The best part about it is it’s not steamed or boiled. Don’t get me started on steamed or boiled vegetables — there are so many ways to cook vegetables deliciously, why would you choose those two? It just beats the snot out of any natural freshness and flavours a vegetable should have when being eaten. That said, if you like it that way, you like it that way. But seriously, try them roasted — you may never go back. Roasting in the oven is a great way to prepare any vegetable because it brings out the natural sweetness and enhances flavour thanks to that wonderful Maillard Reaction. Not to mention it’s so nice to be able to pop something in the oven, set a timer, and put your feet up for a few minutes while dinner cooks. For those of you wondering why I use garlic powder rather than fresh garlic (and I usually love fresh garlic in my cooking), the garlic powder (not garlic salt) imparts a quick way of getting a bold punch of flavour. 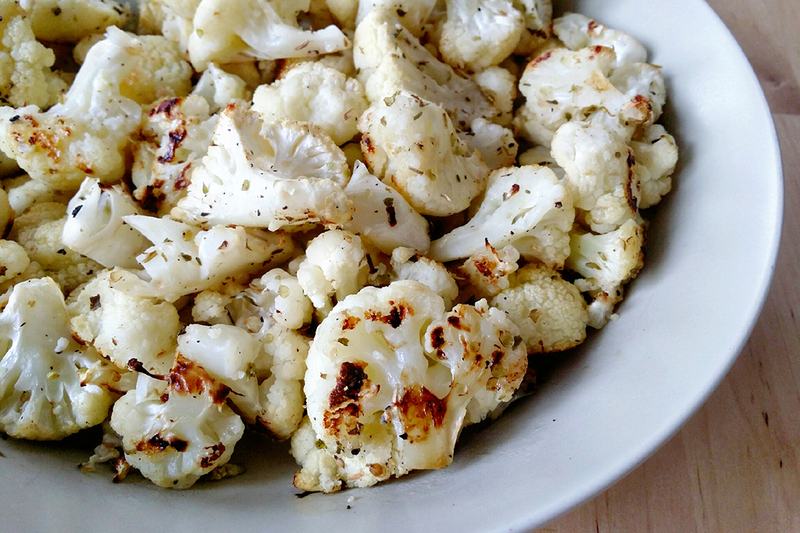 I find garlic powder gives me that punch because it coats the cauliflower florets really nicely and every bite has a good mouthful of garlicky goodness. Simple, hearty, and filling. Seriously, I could eat this all day, every day.